Firstly, I finished the Rut 50 k mountain race the second weekend in. From the start, I felt amazing. I pushed hard with the leader group the entire time. And even though it was raining, and freezing the entire race, my mood was a blissful one. Better yet, my stomach gave me no issues, and I ran without feeling like I held back at all. 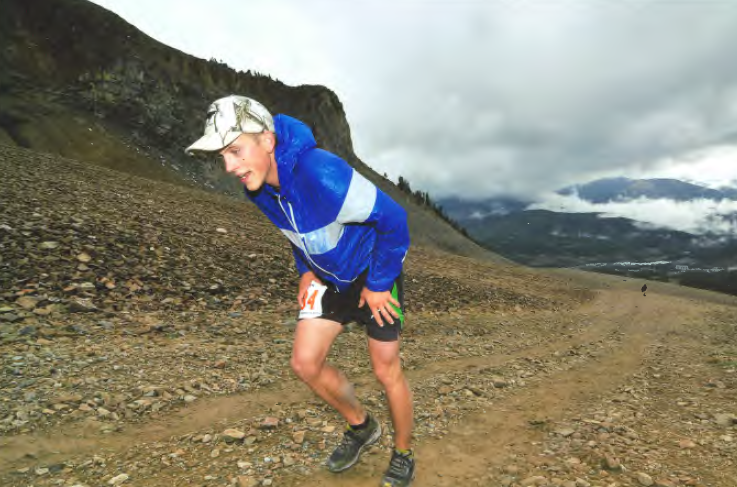 Even with all the non-stop, daily training at altitude here in Bozeman, nothing prepared me for the steep climb up LonePeak, and the painful descent on sharp rocks off trail to the second half of the race. Two different things happened during the race to test me. First, at the second aid station, right before the climb up LonePeak, my legs began to cramp terribly. It was only about 15 miles in, but I could barely even walk when the spasms occurred. I was also out of water, and still one mile from the station. With no choice, I ate two electrolyte tablets without any liquid to wash them down. It tasted like pure salt, and I had to close my eyes and concentrate on NOT throwing up. The feeling of my opponents closing in behind me prompted me forward. Until the climb up LonePeak, I was within sight of all the lead runners, but here is where I slipped back, and the lead pack became more loosely spread out. The second test came on the descent: Once again, my legs cramped up, even though I was taking over double the recommended dose of electrolyte tablets! On mid bound down sharp granite rocks, both legs went stiff and I fell flat on my side, kicking my legs out, but they wouldn’t move! My legs were stuck forward. I groaned and flopped around like a fish out of water. After sitting for a second, my legs loosened, and I ate more tablets, and got my energy back. After the initial climb up the peak, we had two more big climbs before the finish line. I was alone, and had past about 3 or 4 people since the start. I felt good. There was moments during the race, that I was filled with such unexplainable ecstasy, I felt like crying. It was like being high; perhaps from the endorphins. Old poems and profound thoughts and memories flooded my brain, and I was reminded once again why I love the sport of long distance running. After a bit over 6 hours, I crossed the finish line in a strong run. 17th place out of nearly 200 runners. Still short of my goal of TOP 10, but I had no regrets. I ran as best I could, for that day. I felt good knowing that only 14 months before I quit smoking cigarettes after almost 5 years of chain smoking. Nothing like high altitude mountain air to clean the bad habits from your lungs, and build you up again! Immediately after the race, I wash it with the sudden urgency to complete another adventure before leaving Montana for Africa. The snow was hitting the high country, and I knew it was only a matter of time before the weather would hinder me from reaching the high places. So on a Thursday the next week after the race, I schemed a long run that would take me on high climbs: I dubbed it the Spanish Peaks Traverse, as it would cover almost all possible ground of the famed Spanish Peaks in the Lee Metcalf Wilderness north of Yellowstone- around 30 miles (IM not sure the exact distance, as I did not calculate it). On Friday, I planned the route in detail, with dreams of hitting every major peak. I packed a lightweight pack, and my Brooks Cascade 8 trail shoes, and a variety of energy foods. On Saturday morning, I set off. I felt amazing the entire climb from the timber up to high country. On the base ridges of the high Spanish Peaks, I had to put on tights, and warm gloves and beanie, and my handy-dandy Brooks wind-breaker. 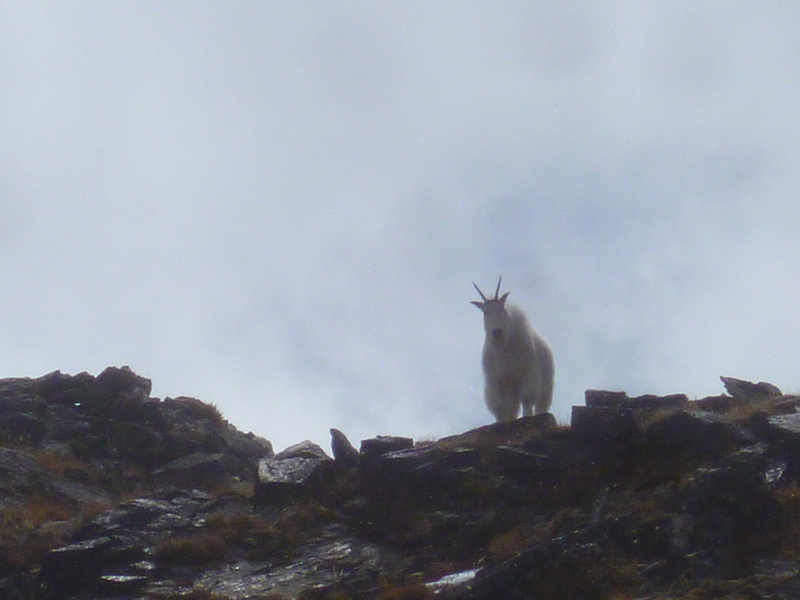 I came close to some mountain goats high on the first peaks, and startled them as they had probably rarely seen people up there. I came to a steep, knife-edge ridge-line that lead up to BeaconPoint- the first very real peak I hoped to hit, out of 5 total. What followed on that Knife-edge ridge for the next two hours was terrifying. In reality, I shouldn’t have done it without climbing gear. At points, I was only a stumble away from dropping over a thousand feet into nothing. At one point, while completely free-climbing a 40foot crack, I nearly slipped and only caught myself by lodging my knee into the crack in the wall. After the initial 40 foot drop, was a steep slide down into a boulder field; most certainly a deadly fall. Then, after shaking with adrenaline, I came to the Crux of the climb: An overhanging slab of granite, suspended over a 200 foot drop to the first ledge, and then a thousand foot drop into nothingness. I shimmied my way across with my feet dangling into space. When I finally reached the grassy summit of Beacon point, I was nearly in tears with relief. I was shaking, and nauseous when I looked at the technical climbs that awaited me ahead. 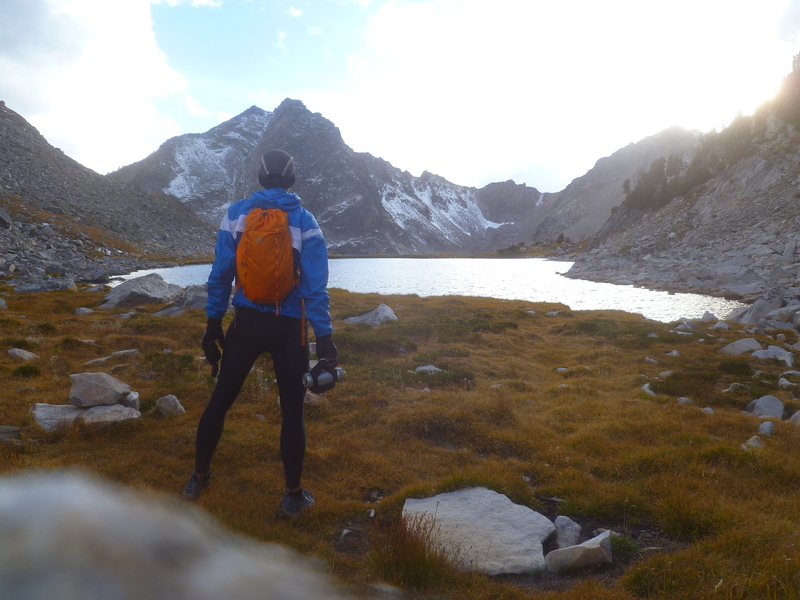 I decided to drop down to lower, alpine meadows, and continue the full traverse, minus the high peaks. This was disappointing, as the Peak bagging had been my main goal. But continuing without climbing gear was foolish, and I continued running at lower elevation. But the adventure wasn’t over yet…. 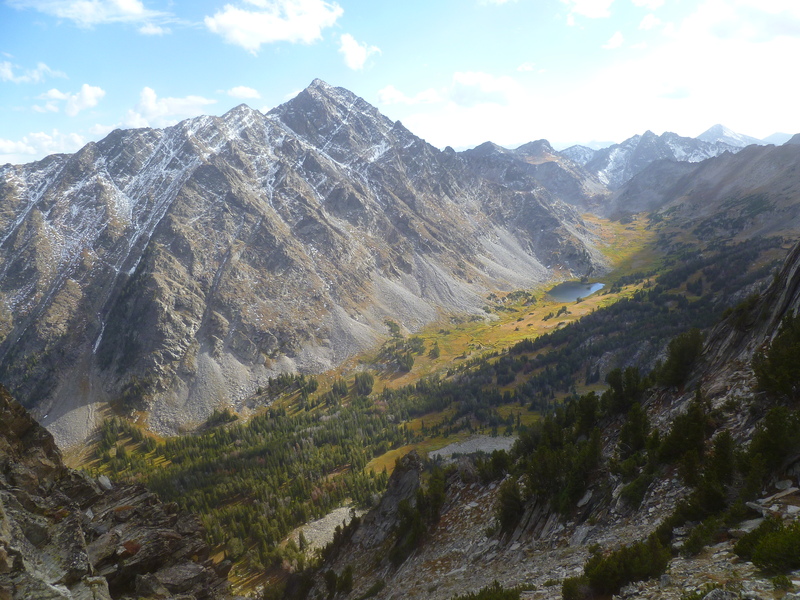 An hour before dark, I found my self above BearBasin. Clear blue skies suddenly began to fill with an ominous wall of mist. The clouds swept over the mountains like a wave, and you could literally see it engulf everything in a matter of minutes. I ran as fast as ever, keeping an eye out for Grizzlies- the area seemed to breath of the animals. I ran, eerily aware of the fact that I would probably get stuck in the dark. I didn’t look at my gps for fear of being disappointed by discovering I might be farther back than I thought from the trail. After an hour of running in pitch blackness, alone, in Grizzly territory, I finally gave in to my curiosity and glanced at the gps. I was still nearly 7 miles from the trailhead! I felt like the weight of the night had collapsed on me. I wanted to build a fire and stay there for a night, but snow and rain began to come on slowly, and I was prompted forward, my heart beating from running but also from the fear of what might lurk at the edge of the path around me. The night was seemingly endless. It felt as if I would ever see the road again. Finally, at 10pm, (after 3 hours of running alone in the pitch dark) I saw headlights bellow. After running on the highway for another mile, a truck pulled up next to me and offered me a ride. He was a young college aged guy from the area, named Dusty. He drove me the remaining 3 miles to my car. Sitting there, listening to calming music, it felt surreal to be in my car after running over 12 hours in new territory. I was glad the adventure was over, but disappointed at the same time. It was trips like this into the mountains that satiated my burdensome boredom. When I got back in town and called my mother to let her know everything was ok, she was in tears. She had been worried when she didn’t hear from me, and even called the local sheriff to send out a search party to look for me! Luckily, they had only just started to look for my car on the trailheads when she called them back to cancel the search and let them know I was Ok. I was amused, thinking about the whole possibilities: Even if something had happened to me and they were out their looking, I doubt anyone would have found me. I had pushed myself to the limits, and knew that the chance of getting help out there— where I went— was slim. In the end, I was sorry to cause my mom worry, but so glad to have left behind such an epic experience- my last adventure in Montana. 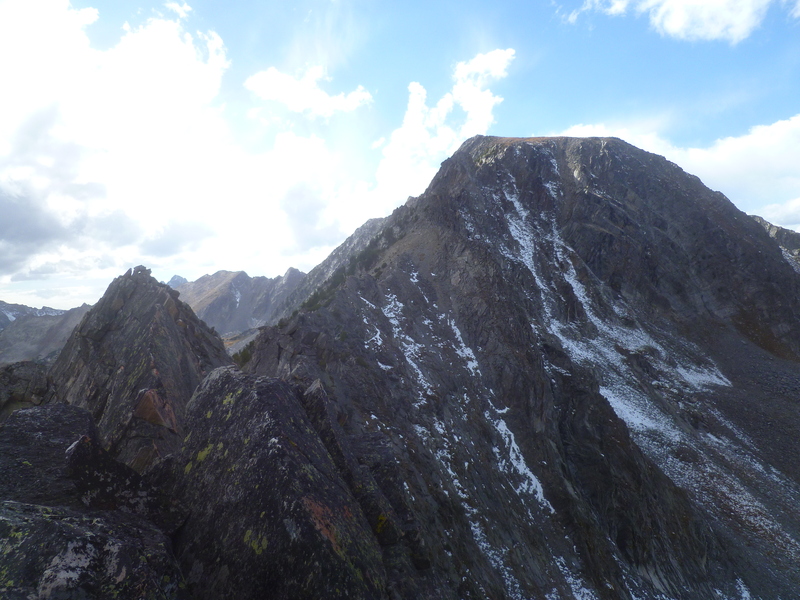 Next year, I will attempt The Spanish Peaks Traverse again, but this time after planting fixed ropes up there, and packing along a harness and climbing gear. Since that time, I have been busy with my carpentry work, and also preparing for my departure to Africa. 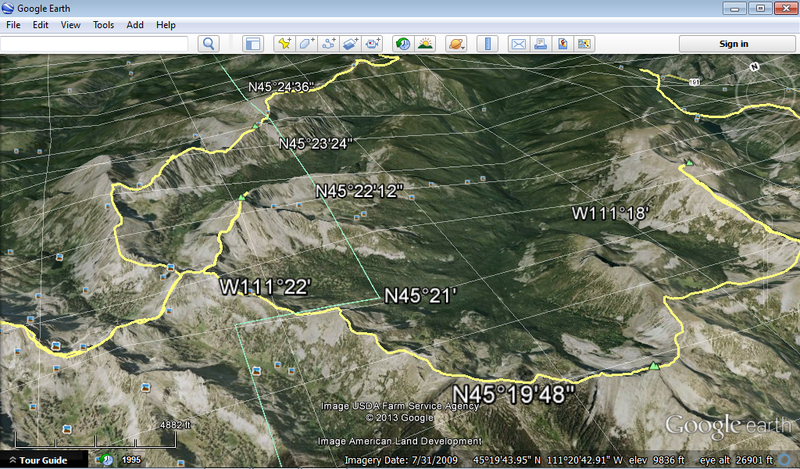 Last night I even cut and pasted the google earth images to make a map of my planned trekking route in Nothern Namibia. Stay tuned on the preparations, and my departure to Africa in less than two months….